Do it yourself Temporary Tooth Kit! Restore your confidence and get back your secure smile with our new patented Temporary Tooth Kit. Unlike the alternatives on the market, this kit actually contains ten various sized teeth caps all molded from real teeth. 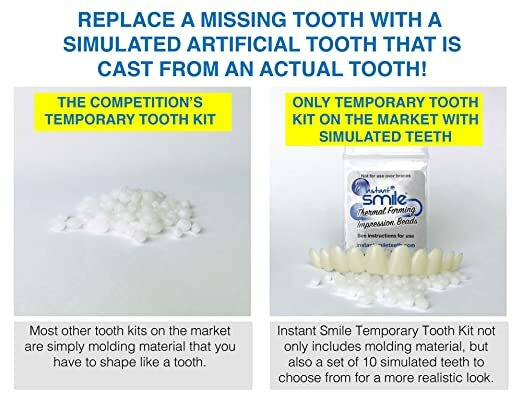 Now you can replace any missing tooth in less than 5 minutes with an actual realistic looking molded temporary tooth. Also available in Bright White and Porcelain White tooth shades to restore a bright white smile. No product out there has a track record like Instant Smile Teeth does. For more than ten years, our company has given millions a secure smile!